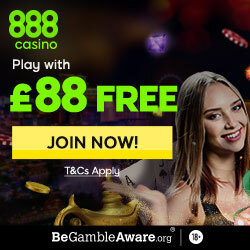 Regulated in Gibraltar and listed on the London Stock Exchange, 888 is a globally recognized gaming brand. The online casino was established in 1997 and the poker room in 2002. Having dealt games to over 25 million customers, 888 is a global brand with worldwide recognition. 888 provides a fun but safe, fair, regulated and secure environment for its players, offers over 20 different deposit methods, and handles thousands of transactions a day!